The Zagros fold-thrustbelt is one of the oldest studied and exploited petroleum provinces of the world, yet for mostly political reasons it has not been fully developed and its exploration has generally taken place in a very piecemeal fashion. Attempts are now being made to develop play concepts that may encompass the whole orogenic belt. Mid-Oligocene palaeogeography ‘Highstand above the Pg40 MFS of Sharland et al., 2001’ showing extent of basin and adjacent shelf systems, produced by integrating data from the whole Zagros orogenic belt. Source: Cambridge Carbonates Ltd Asmari carbonates above Pabdeh marls, Tang-e Gurguda, adjacent to Gachsaran oilfield, showing progradation of slope systems from top left down to bottom right. These Oligocene-age carbonates form the main shallow reservoir system of the Masjid-i-Suleiman, Kirkuk and Gachsaran fields, amongst others. Source: Neil Pickard Aside from historical occurrences of extraction of petroleum from the basin, the initial modern commercial discoveries of petroleum in Iran (then Persia) at Masjid-i-Suleiman in May 1908 and Iraq (Kirkuk, October 1927) marked the beginning of a period of prolific development. Production was initially from Cenozoic reservoirs and during this early phase of exploration there was considerable interchange of pertinent information between the Iranian (mostly Anglo-Persian, later BP) and Iraqi operations (IPC, a consortium mostly comprising elements of the ‘Seven Sisters’). Some remarkably insightful pieces of work, which can be considered industry ‘firsts’, emerged from the region during this early phase of work. Probably the most significant of these were Dunnington’s (1958) review of the petroleum geology of northern Iraq, Henson’s studies of larger benthic foraminifera (1948) and his 1950 paper on reef distribution as influenced by changes in relative sea-level, which preceded the Vail model by 24 years. Similarly, the pioneering use of microfacies and micropaleontology in calibrating reservoir-scale models of Oligo-Miocene carbonates of the region, pre-dating the carbonate microfacies ‘classics’ such as Wilson (1975) and Flugel (1982), was developed in the works of Thomas (1950) and van Bellen (1956). On a production scale, the history of the development of the Masjid-i-Suleiman field by Gibson (1948) is a remarkable account of the early trial-and-error development of the first-discovered field in the region; whilst later work of Daniel (1954) and McQuillan (1970s) on mesostructures has proven critical in the understanding of production-scale fracture networks. Mish anticline, a typically steep-sided Zagros whaleback fold, adjacent to the Gachsaran oilfield. Source: Neil Pickard During this phase, however, there was a tendency for over-complex lithostratigraphic schemes to develop, that reflected differences between subsurface and outcrop, and the individual license areas. For example, in Iraq the Campanian-Maastrichtian shelf formations were named the Hartha and Tayarat in the Basra area and to the west, Pilsener in the Mosul area, but Bekhme and Aqra in outcrop areas of the Iraqi Zagros; all are essentially the same unit/facies. Formations of the same age in Iran and Turkey are named differently again. Any along-strike integration of models and nomenclature was cut short by the nationalization of IPC in 1961, and was then further hindered by the Iranian Revolution of 1979, followed by the various major conflicts in the region. By this time, exploration had extended stratigraphically into the mid-Cretaceous reservoirs, of which the understanding was relatively good, but deeper Cretaceous, Jurassic and Triassic/Permian reservoirs were relatively poorly understood. Consequently, and particularly for these deeper formations, national industries tended to develop their own ‘in house’ models. There was also much re-naming of formations for political reasons (such as the Lower Fars Formation being re-named Gachsaran in Iran, and Fat’ha in Iraq) that often veered away from the possibly more integrated earlier stratigraphic models. Several events in the recent past have caused a reverse in this ‘local’ thinking. Firstly, the re-opening of the Iranian petroleum industry to western companies in the mid-1990s until the late-2000s, and the later opening of the Iraqi petroleum industry in the mid-2000s (ironically at a time when it was becoming more difficult to work in Iran). Added to this, a more plate-wide approach in terms of both fold-thrust belt tectonics and stratigraphy (e.g. Alsharhan and Nairn, 1997; Sharland et al., 2001) emerged at about the same time. Whole-country syntheses, such as Jassim and Goff (2006) and Aqrawi et al. (2010) have also assisted in regional-scale integration of data. In addition, the ability to build large map-based datasets in ArcGIS and Petrel has allowed a properly integrated view of the margin, possibly for the first time. 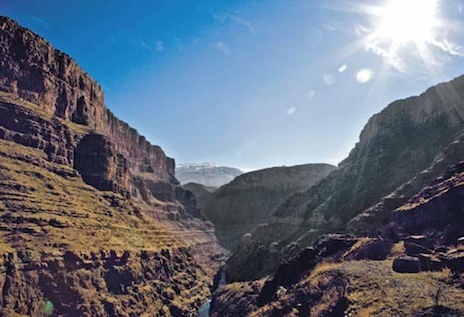 Pir-i-Mugrun Mountain in Iraqi Kurdistan, the significance of which to the understanding the Middle Cretaceous basin margin was first noted by Henson (1950). These carbonates and their Iranian equivalents of the Sarvak form a deeper reservoir system in the Jambur, Kirkuk and Gachsaran fields, amongst others. Source: Saad Jassim In terms of structural geology, a big factor that has proven to be of importance along the whole Zagros fold-thrustbelt is the absence of any significant long-distance overthrusting, or development of complex structures, like imbricated thrusted stacks with internal seals, which are successful in other fold-thrustbelts such as the gas plays of the Canadian Rockies. Most folds are very simple, steep-sided whalebacks. The consequence of this is that play types are relatively simple and rely upon the preservation of only one or two regional seals. Another feature that has emerged relatively recently is that there are wide areas of the folded zone where anticlines have a largely inversion origin, after reverse movement of early normal faults of Triassic and/or Late Cretaceous age. Fields such as Ain Zalah (norh-west Iraq) and structures like Jebels Sinjar and Abd-el Aziz (north-west Iraq and north-east Syria respectively) fall into this category. Development of inversion structures has important consequences for play development because wells placed on the anticline crest are, by definition, testing former basin-center facies (e.g. the fractured basinal limestones that produce at Ain Zalah). Meanwhile, traditionally better reservoir facies may instead be developed on untested footwall blocks, where reserves could be present within stratigraphic or combination traps. Thus, a full investigation of the origins of individual structures may reveal many details that impact prospectivity; it should not be assumed that every structure is a purely late Neogene feature with no history of earlier deformation. The structural complexity of the Zagros belt and identification of major phases of generally extensional basin development and Cenozoic foreland basin evolution have important consequences for stratigraphic development and thus reservoir distribution. Basin extension occurred in the mid-Permian, intra-Triassic, mid-Jurassic and latest Jurassic/earliest Cretaceous, with strike-slip passing into more compressional basins during the late Cretaceous. By way of contrast to the ‘stable’ Arabian Plate interior stratigraphy of countries such as Saudi Arabia and U.A.E., the Zagros margin shows the development of many very significant unconformities. These both destroy reservoir potential by removing regionally-widespread reservoir and source rocks, such as much of the Middle and Late Jurassic, as well as provide new reservoir potential where karstification of carbonates has enhanced reservoir properties, as in the Oligocene reservoirs of the Kirkuk Field. Indeed, it can perhaps be said that the major influence on much of the stratigraphy and petroleum potential of complex areas, such as northern Iraq, are the unconformities and the way they interact with structural development; and in the often thick and localized formations that were then deposited in the intervening basins. Thus, a lack of appreciation of the significance of these unconformities and consequent careless application of formation names has led to extreme confusion in stratigraphies that have been applied to some of the more recent wells, particularly in Iraqi Kurdistan. For example, on some Late Cretaceous fault footwalls, up to 2 km of stratigraphy can be eroded (note the blocks of Carboniferous or possibly older olistoliths sitting in the Maastrichtian basin fill of Jebel Abd-El Aziz in Syria); whilst lower-relief regional erosion has removed much of the Jurassic and later Triassic from regional paleohighs such as in the Khleisia-Mosul area. Mountains near Erbil in Iraqi Kurdistan. Source: Genel Energy Probably of most interest to the oil industry at the present-day is Iraqi Kurdistan. Licensing here is undertaken in an environment that, in general, can be considered more favorable than has been offered in neighboring areas over the past fifty years, confirmed by the very high uptake in license areas and the general high level of activity. 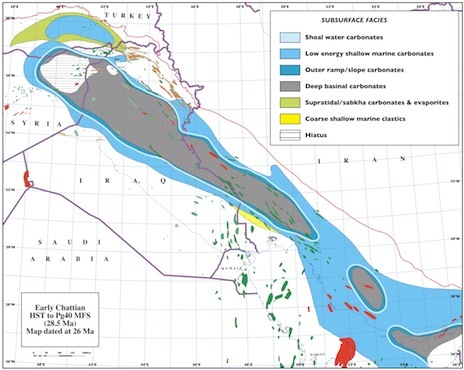 In terms of reservoirs and stratigraphy, Iraqi Kurdistan offers an interesting insight into the use of along-strike analogs because both the exploration history of south-east Turkey and south-west Iran are relevant. Parts of the Turkish petroleum province extend into Iraq and indeed the 2006 Tawke discovery in northern Kurdistan can be seen as having more in common with some of the Turkish fields than with fields in adjacent parts of Iraq. By contrast, the main part of Iraqi Kurdistan is proving to have much in common with many of the deeper Iranian plays, in that fields such as Kabir Kuh and Veyzenhar, which produce gas and condensate from Liassic-Triassic strata, clearly function in the Iraqi Kurdistan region. Recent discoveries have been reported from these reservoir units in the Miran West and Shaikan structures. Other plays that have proven to be worthwhile are shallower reservoirs at Pila Spi (Eocene) and Shiranish (Campanian-Maastrichtian) level, originally suggested by old discoveries considered sub-commercial, such as Chemchemal and Taq Taq. However, these only function properly in the outer parts of the foldbelt because they ideally require the presence of Lower Fars caprocks. In the inner parts of the foldbelt these are absent, so viable plays require lower regional seals – usually Middle–Upper Jurassic and Lower Cretaceous bituminous marls and shaly limestones – to be present and not breached. Other reservoir types that have emerged in recent years include the regionally important hydrothermal dolomite bodies. The importance of these was first recognized in Iran, with the discovery and appraisal of the Azar field, based in large part on analogs of the dolomitized Sarvak Formation in the Anaran Mountains (Sharp et al. 2005, 2006, 2010). This has led to a revision of examples of unusual dolomitization which can be listed, beginning with the dolomitization of the Shiranish Formation in Taq Taq, and massive late diagenetic dolomitization of the Qamchuqa Formation along much of the Iraqi fold-thrustbelt. Identification of these dolomite reservoirs pre-drill requires some degree of good fortune because commonly seismic data quality is not good over anticlinal areas and may not be sufficient to determine rock properties at depth. It would appear that the dolomite bodies developed during the main Neogene compression of the basin. This is similar to high temperature dolomites elsewhere (e.g. Jurassic and Cretaceous dolomite reservoirs of southern Mexico) and it is likely that their formation was in response to orogenic breaching of regional seals and mobilization of deep formation waters rich in magnesium that had been trapped for millions of years in a passive margin setting. Finally, our understanding of the petroleum systems has developed significantly since the 1958 publication of Dunnington’s masterly review. Dunnington recognized the overriding importance of the Middle Jurassic-Lower Cretaceous source rocks, but subsequent exploration and advances in organic geochemical analysis have highlighted the importance of other sources, not least of which is the Silurian, critical for gas generation and responsible for the success of Khuff reservoirs in the foreland basin. More recent work on the Triassic in northern Iraq, Syria and south-east Turkey has demonstrated an active petroleum system in that part of the stratigraphy, which is ripe to be tested in other parts of the orogenic belt. In fact, the main issue with understanding hydrocarbon migration in the basin is that it may prove to be very difficult to unravel the relative importance and significance of each system because there is likely to be a high degree of superimposition and mixing of active petroleum systems of different ages and types within any given area. Thus, the present time is the ideal opportunity for the development of play concepts that may encompass the whole orogenic belt. In this regard a forthcoming conference at the Geological Society of London (January 23–25, 2013) aims to address issues where concepts developed in one part of the Zagros fold-thrustbelt can be applied to exploration elsewhere, as well as presenting the first glimpses of new data that are emerging from the first thorough exploration of the Kurdistan region of Iraq. It is to be hoped that lessons learnt from present Kurdistan exploration can in the future be applied to analogous areas of Turkey and Iran which at present see little activity. Hidden by a thick veil of salt and once thought too deep for liquid hydrocarbons, recent deep water discoveries off the southeastern Brazilian coast could be the largest in the past 30 years. What have we learned from this summer’s exploration drilling activity around the Falkland Isles?